Here are some imaginative Easter egg hunt clues for exciting Easter hunt games. There are amusing picture, word and cryptic clues as well as secret codes to use for a fun-filled Easter egg hunt. You will find on this page the clues for all off our Easter egg hunts. Our Easter Egg Hunt Ideas page has an overview of all of our Easter egg hunt games. You may like to look at it first to get an idea of all the different games we have. All of our games are free! Click here to go to Easter Egg Hunt Ideas. These clues are in age order from youngest players to oldest players. There are clues for: Bunny Hop, Easter Picture Hunt, Easter Clue Hunt, Resurrection Egg Hunt, Easter Storekeepers, Easter Treasure Hunt, Decipher the Code, and Easter Crazy Golf. Click on the highlighted name of the game below and you will be taken to a page with complete instructions for the game. There are six versions of the bunny feet for you to print; the full colour version (shown) as well as blue, green, yellow, red and white bunny feet. Click on the links below to download a copy that you can print at home. If you have a mono laser printer, download the white bunny feet and colour them with pencils, crayons or marker pens. Here are some examples of simple clues for a younger child. Make multiple copies for each group. Examples of Cryptic Clues (These are clues we have used in our own home and with our own family. You will need to adjust them to fit your unique situation). See clues for Easter Clue Hunt and Easter Treasure Hunt for words and phrases to use in this game. Write out your clue (for example, "under your pillow") and then copy it backwards. This can be writing the whole message in reverse order ("wollip ruoy rednu") or write each word backwards ("rednu ruoy wollip") or use a mirror to write the letters backward. 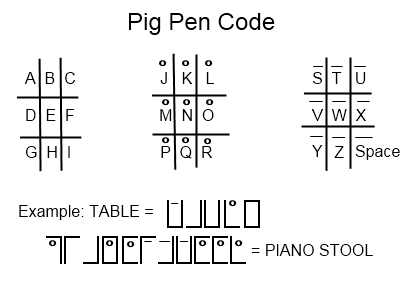 Example: The code for "Under bed" would be: "21-14-4-5-18 2-5-4"
Example: The code for "Under bed" would be: "FMWVI YVW"
Put your clues into Morse Code and see how well your children can decipher the code. Use Braille code for your clues. You could simply draw the code, or for more authenticity you could use a knitting needle to make indentations in the code. If you choose to make indentations, don't forget that you will need to mirror the code since it is reversed on the front of the page. Players putt the ball between the shoes, under the chair, zig-zag through the flower pots, around the tree, over the wooden ramp, under the swing set, through the box and into the can. 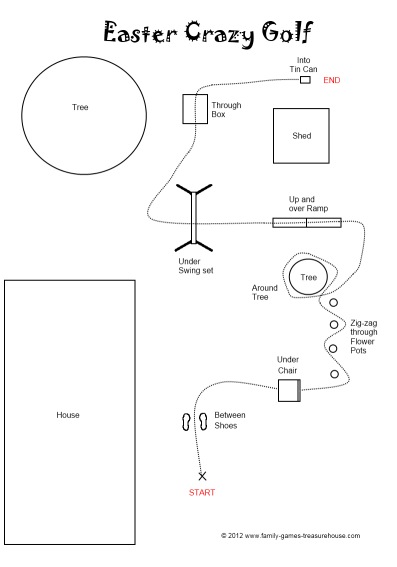 Click here for a printable version of this sample Easter Crazy Golf course layout.